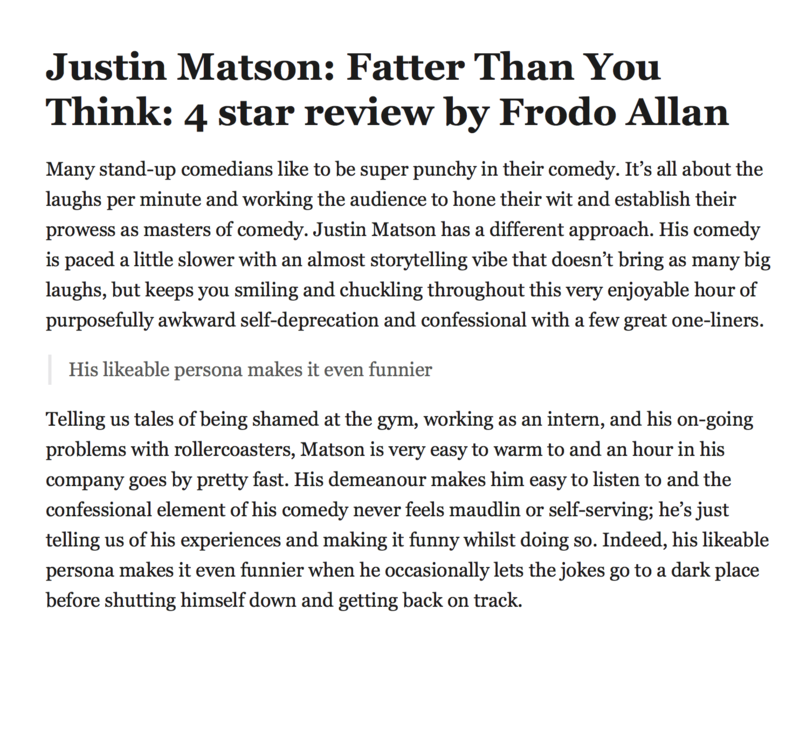 Justin Matson’s been kicked off three rollercoasters for being too fat, and now he’s finally ready to talk about it! Adorably awkward with a twist of gay, Matson brings his hit new show to Edinburgh after premiering to sold out crowds at the Adelaide Fringe in Australia. A critically-acclaimed, bicoastal and bisexual comedian, he’s performed at The Comedy Store in LA, Gotham Comedy Club in New York, and The Punchline in San Francisco. A graduate of the Upright Citizens Brigade Theatre, he has been featured on Fusion TV, and now shares a hilarious and heart wrenching stand-up special about his journey and struggle with body image. It’s real, it’s raw and gayer than a small side salad. Many stand-up comedians like to be super punchy in their comedy. It’s all about the laughs per minute and working the audience to hone their wit and establish their prowess as masters of comedy. Justin Matson has a different approach. 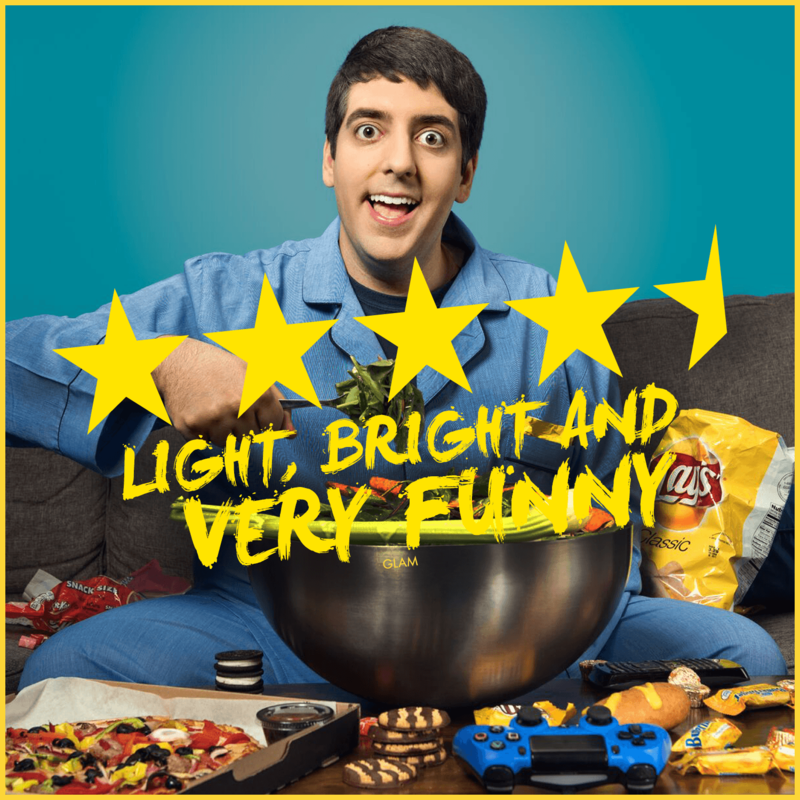 His comedy is paced a little slower with an almost storytelling vibe that doesn’t bring as many big laughs, but keeps you smiling and chuckling throughout this very enjoyable hour of purposefully awkward self-deprecation and confessional with a few great one-liners. This is American comedian Justin Matson’s first visit to Australia and the Adelaide Fringe – hopefully, it’s not the last. Matson is a mild-mannered comic who can still deliver big laughs as well as any of the more gritty in-your-face comedians. But his is a nice, pleasant persona. As soon as he walks out, you know that this is a guy you are going to like – and he doesn’t disappoint. Think Ray Romano, but with a smile. Subjects such as suicide, temping and being Gay are all covered, with a huge emphasis on being fat (although we Aussies would probably call him ‘cuddly’). But Matson has a beautiful self-deprecating sense of humour about it all that seems to make it all light, bright and very funny. Don’t worry, there is a happy ending. This is a very funny and pleasant way to finish up a night of frantic Fringeing.